[The workshop] was full of fun, excitement, play and ideas… It up skilled a few of our more senior staff who were less familiar with game principles, but are now more confident in applying game design methods to online learning and engagement. 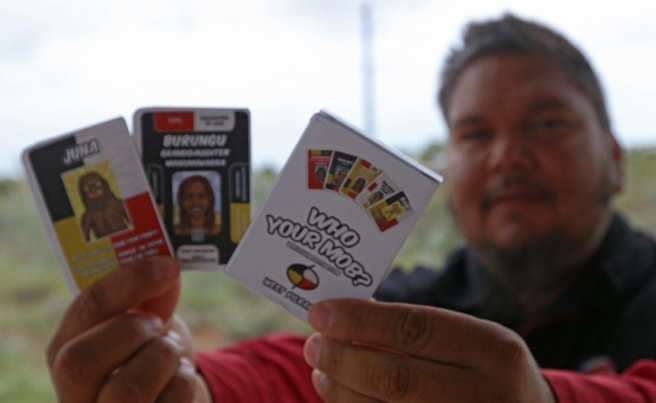 Who Your Mob (Australia's First Indigenous Card Game) is a fun, educational game to teach young people about the Galharra Indigenous skin system of the West Pilbara region in Australia. Indigenous people in Australia use the greeting ‘Who your mob?’ to identify who they are, or how they are connected, to other Indigenous people across Australia. Join the race to beat other players to the Who Your Mob? goal! Connect four family cards into matching sets using correct skin group marriages or family relations, but watch out; the other players will try and stop you. Make three correct family trees first to WIN! Sounds easy, right? Just watch out for those evil spirits… Every time you complete a correct family tree of four, place them to one side to score. The first player to have THREE complete sets WINS!